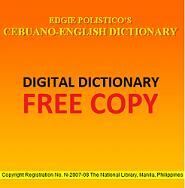 Find Tagalog, Bisaya, English definition and translation of terms. Offering English-Tagalog, English-Bisaya and Tagalog-Bisaya dictionary and translations, this is the best site for you. Bisaya and Tagalog are the most widely spoken language in the Philippines especially in Luzon, Visayas and Mindanao. Welcome to the Philippine Language Translator and Dictionary! The Philippine language translator and dictionary or simple Filipino translator offers Tagalog translations and Bisaya translations to English. It also offers Tagalog-English dictionary and Bisaya-English dictionary. It has lots of free translations by using the Tagalog to English, Tagalog to Bisaya, Bisaya to English, Bisaya to Tagalog translator, English to Tagalog and English to Bisaya translator. Translate Tagalog terms to English by typing the Tagalog word, group of words or phrase in the search box and hit Search. You can also do the same thing when searching English and Bisaya translations, meaning and definition of terms. Instruction: How to find definition and translation of the Bisaya (visayan and/or cebuano) word or phrase? You can search for English, Bisaya and Tagalog terms by selecting the desired language in the drop-down list. Type the word you are looking for in the search box and click the search button. The results will then be displayed below the search bar. Related words are also displayed below the main result if available. Suggested words are displayed especially when your search term does not matched any of the words or phrase in the dictionary and translation database. Those words are made clickable for you to do a reverse look-up. Enhancements are made from time to time for the search algorithm to provide you accurate and better results. Stay tuned. We're still on beta state... Mabuhay! Mabuhi!